Through their membership in the Canadian Council of Aboriginal Business (CCAB), Papasay was able to formulate a relationship with a fellow CCAB member, Canada’s largest janitorial company, Bee-Clean Building Maintenance. 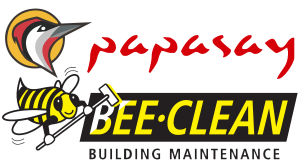 In 2015, a Partnership Agreement was signed between Papasay and Bee-Clean, forming a new company, “Papasay Bee-Clean”, with Papasay as the 51% majority owner. The new entity works with large companies contracting opportunities throughout Ontario. The benefits to Papasay include employment for any BNA members wherever they reside throughout Canada, as well as a revenue stream to the corporation for contracts won through the partnership. Bee-Clean has local infrastructure in the Thunder Bay region with a regional office, which houses our management, administrative, human resources, and safety personnel.